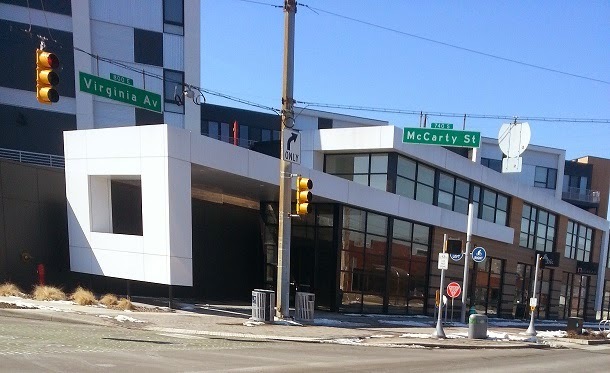 The Fletcher Place neighborhood in Indianapolis is getting a new brewery-brewpub in early-Summer at Virginia Avenue and McCarty Street. Chilly Water Brewing is being opened by veteran pro-brewer Skip DuVall with 8 taps of fresh local beer and a music themed atmosphere. I recently caught up with Skip to learn about the venture. Chilly Water Brewing plans to have 8 taps to start and will feature an American Pale and a German Lager while rotating beers, all made on site to start. The brewpub will serve light food like paninis and hummus with a simple menu. The Asian fusion restaurant ROOK (corrected, earlier post misspelled) is next door and they may find a way to partner. The design will allow the brewing operation to be visible through glass and will have efficient seating for about 50 inside as well as outside space for another 30+ patrons. For those interested in the technical side, Skip will be using a 7 BBL system with extra fermentation capacity. Skip DuVall is a former brewer from Alcatraz brewing which is now gone and moved from there to nearby Fountain Square Brewery. Skip is so conscious of recycling he does not plan to sell bottled water — so no recycled plastic. The construction will take a couple of additional months so Skip will only say “early Summer” but I look for a late-May to early June possible opening. They have opened a brewery and brew pub on the site of the former Mishawaka Brewing, but make no mistake says General Manager of Brewing Operations Shawn Erickson, the building looks totally different! While the community has respect for the legacy of a brewery (one of Indiana’s earliest brew pubs) at 3703 N. Main St. in Mishawaka, the building was completely gutted, a new gastro-pub was built and entirely new brewing system that is four times larger than their Culver, IN site was opened. While the Culver operation will remain open as a brew pub the former system may be used as a pilot but all beer will be brewed in Mishawaka. The family that owns Evil Czech already owns Corn Dance restaurant in the city where Evil Czech beer is served. The brewing operation started in 2012 and expanded to taps throughout portions of Indiana during 2013. Brewing capacity increase clearly allows further expansion of such beers as BobbleHead, Evil Czich, John the One Eye, Stalin’s Dark Side, and many more. Stalin’s Dark Side was released again this month and is a bold and toasty Russian Imperial Stout at 10% alcohol. The Bobblehead wheat is a flagship beer. The family group grows many of their own hops and raises bison for meat in the restaurant. Owner George Pesek is originally from the former Czechoslovakia and is a trained and noted chef. The new restaurant had a soft opening this past week and is open 5-10PM during March with the bar open later. Evil Czech offers Mug Club memberships online; check out their Facebook site for details. RAM Restaurant & Brewery will tap a Schwarzbeer they’ve named “Arnold SCHWARZenegger” using Pilsener and Munich malts with a touch of roast barley character, this German style beer is dark in color while being lighter bodied and smooth. Tapping is 6:00 PM, Thursday, March 20, at the Indy downtown location, 140 South Illinois St.
Get the Bloomington Beer Festival and Bloomington Craft Beer Week on your calendar. The BCBW festivities will begin at local pubs and restaurants Friday, April 4, with special tappings continuing through Friday, April 11. The festival is Saturday, April 12, in the Woolery Mill 2200 Tapp Road 4-7PM for $35 with early bird available one hour earlier. Hotel rooms at group rates are available at the Fourwinds Resort with shuttles to and from the event. Tix online HERE or at Big Red Liquors stores. A 4-way collaboration between: Upland Brewing, Bloomington Brewing Company, Quaff On! Brewing and Function Brewing produced a Black American Wheat to be available at this fest. Tickets for the Upland Third Annual Sour + Wild + Funk Fest are available online at Eventbrite here The festival to be held at the historic Indianapolis City Market will be Saturday, May 17, 2-6 PM. A VIP Sour lecture and private tasting will be held from 12:30-1:30pm. VIP tickets can be purchased for $75, and will include VIP lecture, lanyard, commemorative T-shirt, swag bag and access to the VIP lounge. Of course Dark Lord Day on April 26 is sold out but a few tickets can often be had from those who do not attend. ← Previous Previous post: Saint Patrick’s Day weekend! What beer to drink?